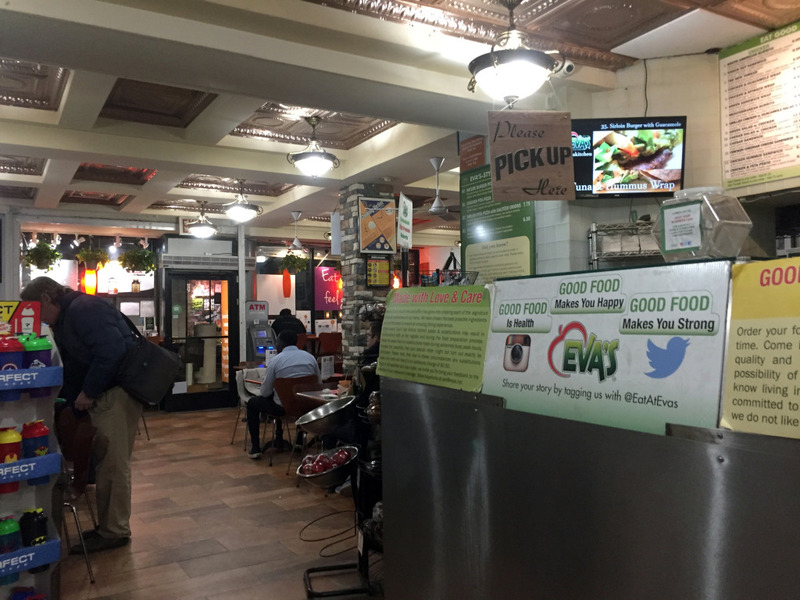 Last Friday, I visited Eva’s Kitchen on W 8th St. for a bite to eat. They kindly invited me for a meal and a chat, and I was delighted to accept. Upon arrival, enthusiastic and welcoming Alex came around the counter and took my order, chitchatting with me about the menu while I deliberated over the options. 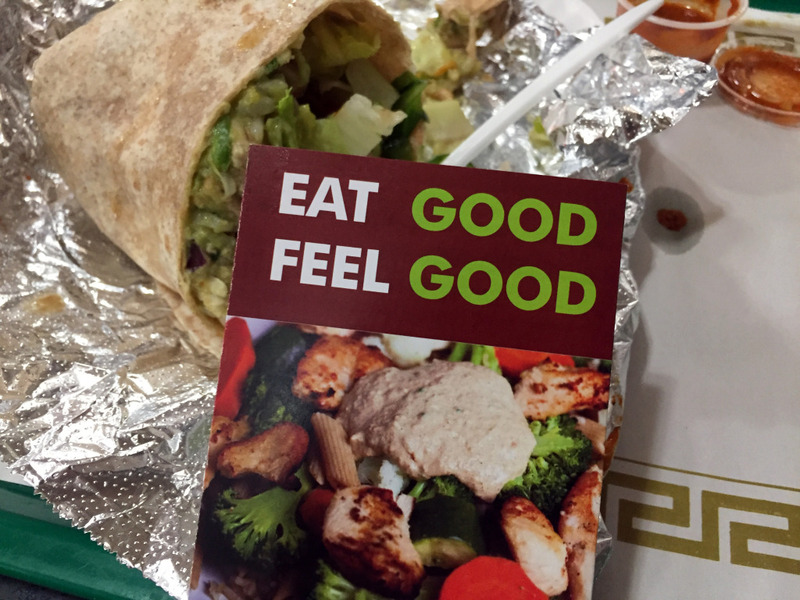 Salads, wraps/burritos, “power plates,” smoothies—choices galore! A whole section dedicated to vegetarian options too! It is clear just looking at the menu and its featured ingredients that this is a restaurant dedicated to serving and pleasing a wide array of health-conscious, hungry individuals. Brown rice, egg whites, sweet potatoes—whole grains and lean sources of protein…What could be better? 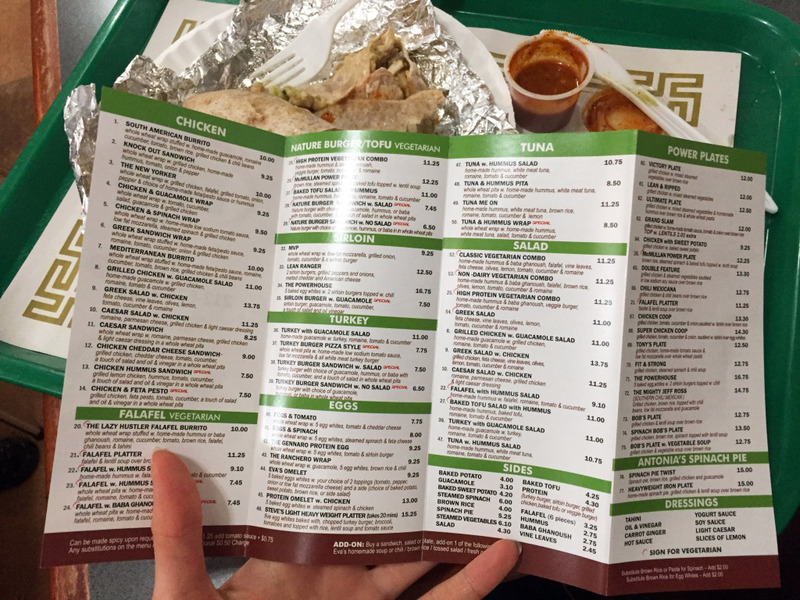 Alex told me that his particular favorite is The Mighty Jeff Ross: grilled chicken and brown rice topped with chili beans, low fat mozzarella, and guacamole—apparently one of their best-sellers (and, by the description, I can understand why—simplistic, hearty, and delicious). I took his input into consideration and went with the South American Burrito (which is pretty similar to The Mighty Jeff Ross with some tweaks here and there)—a whole wheat wrap stuffed with homemade guacamole, romaine, cucumber, tomato, brown rice, grilled chicken, and chili beans. I grinned satisfactorily at my choice as I placed my order and made my way over to a table to (hungrily and eagerly) wait in anticipation. Eva’s is clearly a hotspot in Greenwich Village. The restaurant’s aura is relaxed and casual in the best way—that is, the opposite of too many NYC cafés that are so trendily hoity-toity that just walking in the doors can induce a crushing self-conscious feeling. Eva’s, on the other hand, is wonderfully warm and inviting. Perhaps this is due to the history and authenticity residing within its walls. 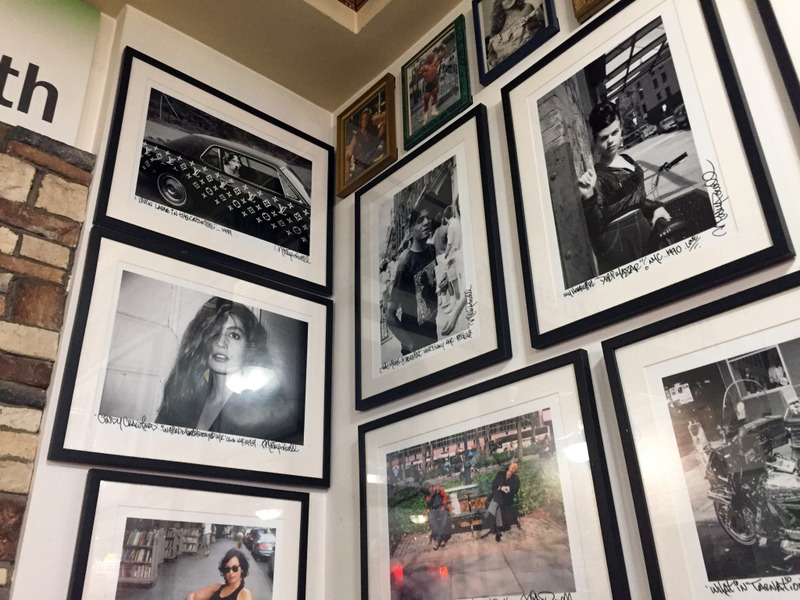 This February, Eva’s is celebrating its 40th year anniversary—that is, this landmark joint “serving delicious and nutritious food” (with a Mediterranean flair, it seems) has been around since the Spring of 1978. That’s over twice my age…Pretty cool! As I waited, Steve (the store manager) wandered over and began chatting with me. I was struck by his kindness and spirited pride in all that is Eva’s. His kindness was contagious as we sat and talked. He told me about his personal favorite on the menu—The Eggs & Tomato: a whole wheat wrap with 5 egg whites, tomato, and cheddar cheese. I’ll have to try it next time. He explained that the motto of Eva’s Kitchen is: “Eat good, feel good.” Their trademark is healthy food that tastes good and makes you feel good. He even mentioned that they cook with no preservatives. I was thrilled to hear that—it’s hard to find places in the city nowadays that actually care about quality of ingredients and how their food makes their customers feel upon leaving. 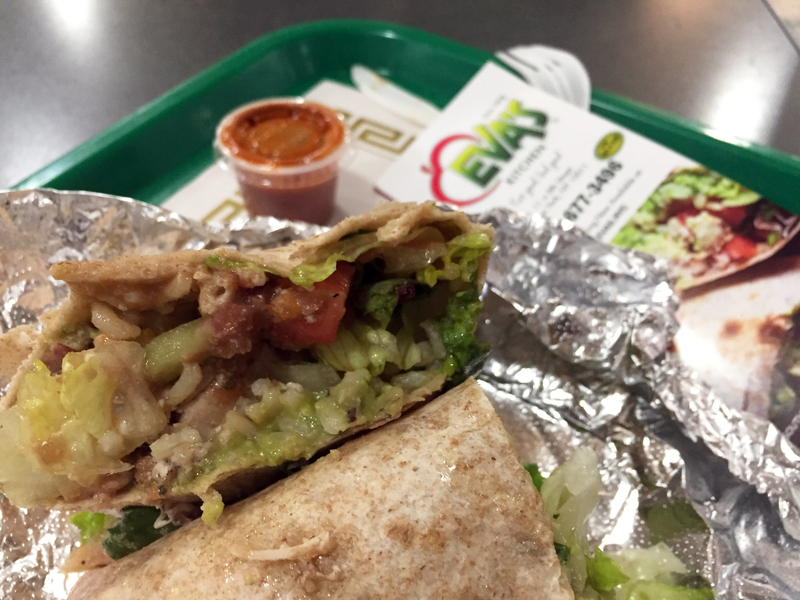 My burrito came very quickly; I was very impressed by the quick service. Steve left me to enjoy my meal—although without first talking up and bringing me their house-made hot sauce (which, he mentioned, is somehow free of salt altogether!). I’m a spicy food lover, so I was very excited to try it—and very pleased with its tangy, flavorful, and subtly smoky flavor. And, of course, it did bring the heat. Overall, I had a blast visiting Eva’s. Particularly notable was their very fast service; lively and personable staff; extensive menu with something for everyone and anyone (no matter what preferences or dietary restrictions one might have); the constant ebb and flow of colorful customers (it clearly is a hotspot! ); and the warm aura altogether. I left with a full belly, a smiling face, and a piece of carrot cake to-go (thanks again, Steve!). Wholesome seems like a very fitting word to describe both Eva’s ambiance and tasty (yet still healthy!) food. The authenticity defining the years of memories made within, the food served, the friendly staff, and the hungry visitors (be them regulars or newcomers) seems to be what makes Eva’s uniquely…Eva’s. And due to such authenticity, Eva’s undoubtedly stands out as an NYC gem. I cannot wait for my next visit. As an NYU student with this place right around the corner from campus…Watch out Eva’s, I think I just found my new favorite lunch spot! 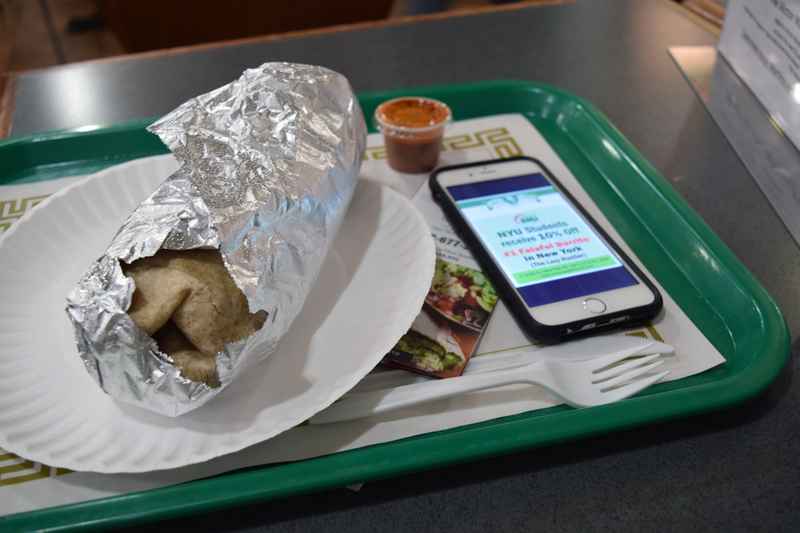 *If you’re an NYU Student, make sure to stop by Eva’s and get 10% off The Lazy Hustler (“The #1 Falafel Burrito in NYC”) when you show your student ID! Libby is an NYU student, a Campus Clipper foodie, and a passionate writer and graphic designer. She writes her own blog, libalittle.com, where she strives to share insight, encourage creativity, and stimulate curiosity. 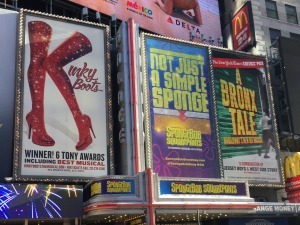 Broadway doesn’t come cheap. If I were a millionaire, my first impulse would be to snag every full-price Broadway ticket. When I was living in Houston, Texas, I dreamed of faraway land of fantasies and wonder of Hamilton and the Comet of 1812. But they’re too pricey to fly from city just to catch a show. 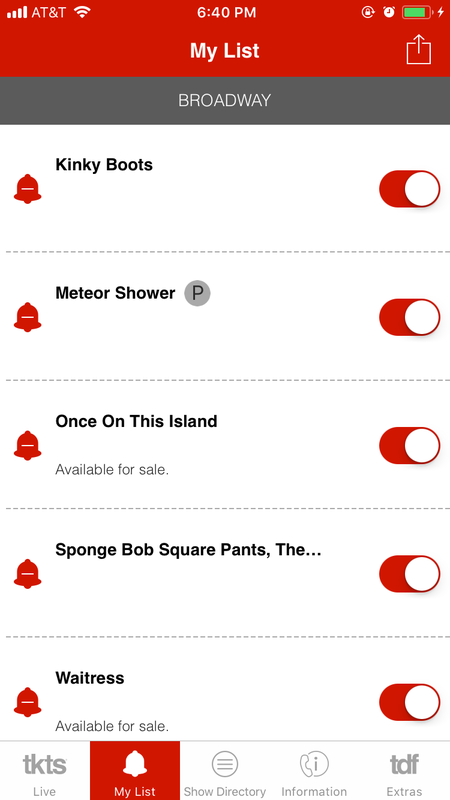 Because current productions aren’t available on DVD or Netflix, they aren’t easy to access. Now having moved to New York City, I confronted plenty of tricks and trades of bargains. It’s not perfect: There are shows too far out of the reach (Curse you, sold out and overpriced Hamilton tickets!) but a student status and familiarity of deals can assuage your thrifty habits. 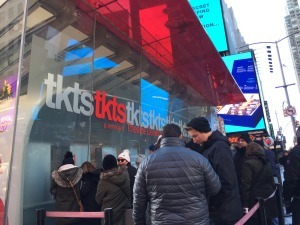 In 2014, LA Weekly cited that an average Broadway ticket costs a daunting $100, but truth is, ticket prices are often in flux. That does not account for high-demand productions like Hamilton, Hello Dolly, or Once Upon an Island. As a graduate student, I don’t have my wallet full enough to buy $100 tickets on a whim. First, ask yourself how much you are willing to spend per month on tickets. My personal goal: 2-3 shows a month. I aim for about $50 or below for each ticket. I’ll have money left for groceries. If you’re a student or recent graduate, you are eligible for membership with the Theatre Development Fund (the TDF). Yearly membership fee is $35, which is a fair trade off to access $51 tickets, about 50% of the average ticket price. I give fair warning: TDF seat selection is a wild card. Before a purchase, it will warn you whether seating is in mezzanine or balcony, but you will not be informed of the exact seating arrangement once you order your ticket. I can credit it for not shoving me at the far rear or the balcony. Once in a while, I got sweet deal of center orchestra seating for School of Rock or center mezzanine for the Cats revival for a grander scope. 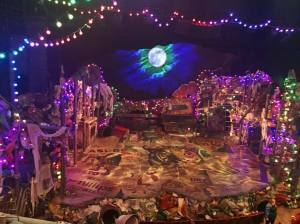 My scope of the mezzanine view of the Cats revival, courtesy of TDF. Every so often, I was planted at the far side of mezzanine, but a decently close to the front. At one point for Anastasia, TDF put me on the front-row orchestra. Sounds wonderful but there was this catch: It was the orchestra-left side farthest from the center, an angled neck-straining viewing experience. I find that TDF discount has more variety of Broadway productions than other sites that offers discounts for $51. Average traditional student discounts of $51 often regulates you to the third-floor balcony seating, which I find to be far enough to deem “riiiiiiip-off.” But TDF’s $51 musical tickets have situated me in orchestra or the second-floor mezzanine and never placed me on the 3rd floor balcony. If you are chancing on a balcony seat, the purchase will warn you beforehand. 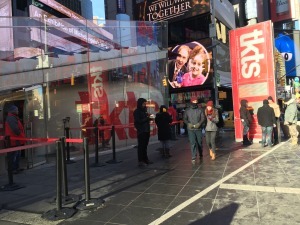 Long-running and high-demand shows like Phantom of the Opera or Hello Dolly will appear, but don’t expect Wicked, The Lion King, or Hamilton to magically pop up one day (I’m keeping my eyes peeled for those). Ordering through TDF online is ideal for a shut-in introvert like me. I don’t have to rush to a physical location or wait in line for the suspense of obtaining bargains. I never expect the TDF price to radically hike up. Few times, they have sales for tomorrow’s performances. It’s also great for long-term planning. Depending on the available line-up of show dates, TDF allows me to plan ahead with show-dates. 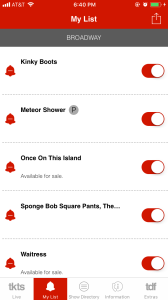 I got my Spongebob Squarepants ticket a few weeks before I saw that nautical delight. Be prepare to email a photo of your student ID or enrollment form as proof of eligibility at POE@tdf.org within 10 days of starting membership.